Initially, tactical plans were also intended to include measurements of progress for each focus area; however, because of the volume of information, these measurements will be published separately every November. The Success Indicator Baseline Report was released in November 2014. Future success indicator reports will compare their measurements against the baselines outlined in the 2014 report. 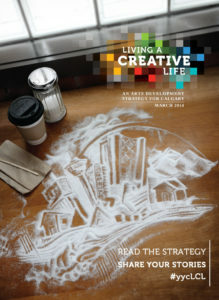 Living a Creative Life is an arts development strategy of wide scope, and neither Calgary Arts Development nor the signatories expect all of the tactics in this document to be undertaken at once. Priorities will emerge as signatories align their work to the strategy’s outcomes. Refer to Context, Process Overview and Strategy Framework sections for further background.